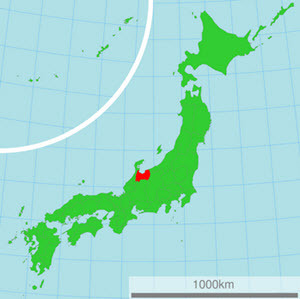 The Toyama Prefecture is located in the Hokuriku region of Honshu, bordering the Sea of Japan to the north. A lot of hydroelectricity is produced in Toyama, which in turn has made it a desirable location for power-intensive industries. Roughly 30% of the prefecture’s land area lies within designated Natural Parks, including the two national parks Chūbu-Sangaku and Hakusan, the Quasi-National Park Noto Hantō, and six prefectural natural parks. In 2012, a glacier was discovered in Toyama. This is the only recognized glacier in East Asia outside Russia. Tate-yama, also known as Tateyama, is one of Japan’s Three Holy Mountains (the other two are Fuji and Haku). Located in south-eastern Toyama, Tateyama is 3,015 meter above sea level at its tallest peak, the Ōnanjiyama. In 1934, the Tateyama area became the Chubu-Sangaku National Park. Tateyama is chiefly composed of granite and gneiss, with a small andesite-dacite stratovolcano located along the ridge and plateau about 2 km west of the Ōnanjiyama summit. The last eruption occurred in 1839. A shrine is located at the Oyama peak, where climbers can receive warm sake and be blessed by a priest. The traditional gassho-zukuri houses of Gokayama made this part of the prefecture a UNESCO World Heritage site in 1995, together with neary Shirakawa-go in the Gifu Prefecture. Examples of former villages located in Gokayama are Taira, Toga and Kamitaira. Traditional houses survived in Gokayama since the area, located at the upper part of River Shogawa, is so secluded. There are many houses here that are over 300 years old.